The walking foot is a favorite among quilters. It’s a must-have accessory for my straight-line quilting. For my not-so-straight- and wavy-line quilting, too. Would you be surprised to learn that it’s also a super home decor, craft, and garment-sewing accessory? The same features that make it so awesome for quilting – “pinching” layers together to keep them from shifting, and moving with the fabric rather than sliding over it – are fantastic for working with sticky materials like vinyl and leather, stitching “squishy” velvet and Minkee fleece, sewing knits and handwoven fabrics, and for keeping stripes and plaids aligned. This is one presser foot that I keep close to my sewing machine, ready to use, no matter what I’m making. BERNINA Walking Foot #50 has three interchangeable soles: Regular, open toe, and edgestitch (my new favorite, shown above. 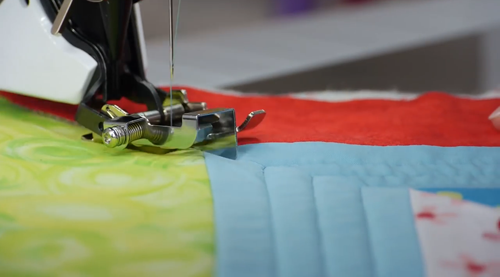 Here’s a short video from BERNINA International featuring a technique using each one: Matching plaids, straight-line quilting, and stitching-in-the-ditch.